Presumptive Republican presidential nominee Donald Trump is getting his own brand of security, a type of protection that somehow only seems befitting of the New York mogul himself — at this year's Republican National Convention, the usual boys in blue will be joined by a fleet of leather-clad bikers atop motorcycles. This added-on security, all of whom have taken up the cause voluntarily, is a group called Bikers for Trump. Their sole purpose, aside from adding some branded muscle to the Trump crowd? Connect "patriotic bikers" from across to country with a core mission: elect Trump for president. The Bikers for Trump's official website is quick to do two things: they stress that they are a group that wishes to "inform voters on issues confronting America" (but give no outline of what those issues are, exactly), and that they do not, under any uncertain terms, endorse violence against the protesters they encounter at rallies. The specific wording on that rule is curious, however — the group says that they do not "endorse confrontations with paid protesters at Trump for President appearances," and though they believe in the rights outlined in the First Amendment, they nevertheless "denounce protesters being paid and provided untruthful propaganda." The interesting part of that, of course, is the idea that people protesting during Trump's appearances are paid to be there. But this mirrors Trump's own take on how people could possibly protest him and his message: they'd have to be paid, of course. Last month, as fights broke out across a Trump rally in California, Trump blamed the chaos on "paid agitators" who were supposedly "sent by the Democrats." He was unable to offer any evidence to back that claim, but the talking point seems to have been adopted by the Bikers for Trump group nevertheless. 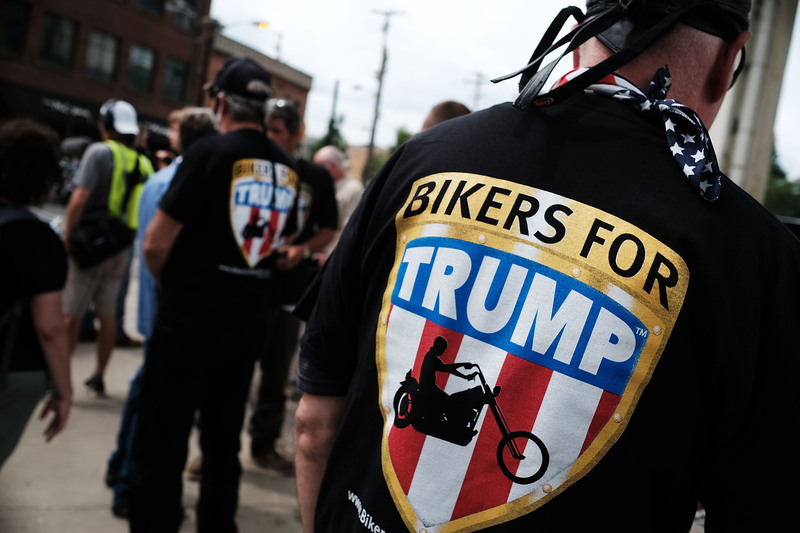 Gawker's Andy Cush spoke with a number of people from the Bikers for Trump group as they headed to the convention on Monday, and while their rhetoric closely borrowed from this anti-violence creed, they appeared to leave some things open to interpretation. For at least one biker, there seemed to be an understanding just below the surface that they would not directly enact violence, but had no problem resorting to violence should they feel it was necessary. When Cush asked him if the bikers' presence might exaggerate tensions instead of lessen them, the biker responded: "All we can do is put ourselves between the innocent victims and the harm. We’re here to back the police, not be the police. With a group of bikers, though, you have to understand. If somebody starts a fight, a biker usually finishes it." As Young Conservatives reported, the first day of the convention seemed to end without any conflicts between bikers and protesters. The bikers were ready, however, to build a human wall between protesters and the convention space, yet another wall that separates the Republican candidate from reasonable disagreement.